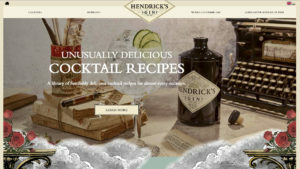 Super premium gin brand Hendrick’s Gin, has launched new websites for five of its key markets – UK, USA, Canada, Spain and Germany. The Global Brand Team worked with their lead creative agency Quaker City Mercantile on the creative designs, Edinburgh-based 8 Million Stories on SEO and UX & digital agency DotLabel to ensure the new websites stayed true to the Hendrick’s brand whilst offering search engine optimisation across devices, bespoke and immersive user journeys and improved user experience. This is the latest project DotLabel have undertaken for Hendrick’s Gin, previously having worked on digitally supporting the brand’s L.E.V.I.T.A.T.R.E campaign at Canada’s Nuit Blanche live event in September 2017.